Catriona and I took the bus from Siem Reap to Phnom Penh through a company called Giant Ibis who had come highly recommended through traveller’s reviews online. This bus is about as comfortable as a bus journey in Asia can be; air conditioning, big seats, and most importantly water and cakes all included in the price. The journey takes about six hours including a little lunch stop on the way. When we arrived in the capital city we ordered a tuk tuk to our hostel Monkey Mia. Our tuk tuk driver instantly quizzed us about whether were planning on visiting the Killing Fields on our visit to the city; of course we were but we tried our best to down play our plans as we were all too aware of tuk tuk scams. In the end, the tuk tuk driver just would not take no for an answer and told us he would waiting for us outside the hostel at 8am the next morning ‘just in case’ – great. Feeling a little awkward from the tuk tuk encounter we made our way inside the hostel to be told that we had booked the wrong dates – we weren’t booked in until the next day! Even worse – the hostel was fully booked! The hostel recommended we try the Top Banana hostel which luckily had a couple of beds in a shared dorm room available – we swiftly made out way there, dumped our bags and headed out for dinner. By this point neither of us clearly wanted to walk out that far so we settled on the restaurant across the road from the hostel called the Herb Café. The next morning we woke up early, packed up our bags and headed across to the Mad Monkey hostel where we actually had a reservation for that day, via a little breakfast and coffee stop off at WN bakery. We were almost embarrassed to see out tuk tuk driver from the previous day was there, just as he said, waiting for us. We managed, after a fair few stern words, to tell him we weren’t interested, and he eventually left. Inside the hostel we enquired about the price of one of their own tuk tuk drivers to take us to visit the Killing Fields for the day – of course – their prices were a fraction of what the other tuk tuk driver was asking. It just goes to show how careful you have to be to avoid being ripped off. We agreed on a price and met our very lovely driver – Sol. He was super friendly and made sure that we tucked all our bags firmly inside the tuk tuk. Apparently it’s not unusual for people to get their bags stolen from inside moving tuk tuks in the city – you have to be super careful. 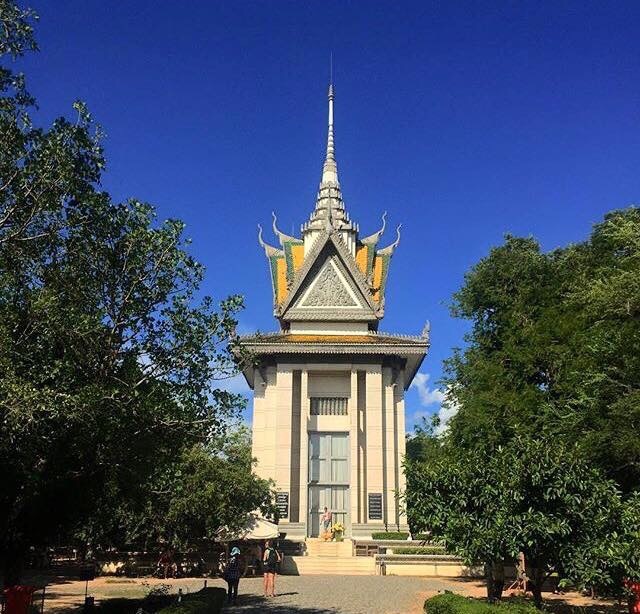 Today we would be visiting two of the most harrowing and poignant sites in Cambodia’s tragic and recent, history; the Killing Fields (Choeung Ek) and the Tuil Sleng Genocide Museum – also known as S21. We knew we were in for a difficult and moving day ahead of us, but this was something we know we had to visit whilst we were in Cambodia. In 1977 the Khmer Rouge political party came into power in Cambodia, led by Pol Pot. Pol Pot lied to the Cambodian people in order to be voted into power, he promised he would reinstate the beloved Royal Family in order to gain votes, however this was ultimately a massive cover up of his true intentions for the country. Pol Pot believed that by enforcing his extreme version of Mao (Chinese) communism, Cambodia would become self-sufficient and would be freed from Western control. In order to achieve this ‘ideal’ Pol Pot wanted to make Cambodia a purely agricultural country where the citizens would always remain a lower class status beneath him. Pol Pot didn’t want to risk anyone being more clever, knowledgeable, or powerful then himself so he set about killing millions of the country’s peoples. These mostly consisted of the educated; students, teachers, doctors, lawyers and anyone who he saw as a threat. People were even killed for simply wearing glasses. People would be rounded up and taken to prisons where they were detained, stripped of their identity and tortured in the most brutal ways. They were only sentenced to death once they had been forced to make a false confession of being a traitor in some respect to the Khmer Rouge. In this instance, the longer a person could withstand the torture, the longer they would live. When not in the torture rooms, people we held in communal rooms, shackled to the ground with barely enough room to sit, let alone lie down. They weren’t allowed to talk, and of course, were subjected to listening and even watching, the torture and beatings of others in the room. One of the most sickening factors of these happenings was that most of the ‘soldiers’ carrying out the beatings were teenagers between the ages of 15-20. Pol Pot prayed on the young and brainwashed them into following his orders under the fear that if they did not comply, their families would too be subjected to these atrocities. Once a confession had been received, people were rounded up and taken to a killing field where they would be executed and dropped into a mass grave. Bullets were seen to be too expensive and therefore people were killed in other distressing ways. This was all done at night time with the sound of traditional Cambodian music playing to muffle out the sound. This brutal regime went unnoticed by the rest of the world for over six years. In that time over 40% of the population was killed, a mind boggling 3 million people. Catriona and I visited the sites in slightly the wrong order; we first visited the Choeung Ek Killing Fields, before visiting the s21 Genocide Museum afterwards. The Killing Fields, at first glimpse, appears to be an almost tranquil, grassed park, however the more you walk around, the more the horrors become apparent; the mass graves where women cowered with their children, the tree where babies were beaten against, the ‘magic’ tree where the speakers were hung to muffle the sounds. Even today bones and pieces of fabric are still brought up to the surface in the rainy season – it really is hard to comprehend what you are looking at. Having spent some time at the Killing Fields, Sol drove us across to s21, which really brought the atrocity to life. As this is a fairly recent historical event, the prison is left very much untouched. The shackles, barbed wire fencing and even blood stains remain at the prison as a very lurid reminder. There were only seven survivors of s21 prison, only two of which remain to tell their tales today. Whist we were there we saw survivor, Chum Mey which was incredibly touching. Chum Mey was, remarkably, allowed to live because he could fix the jailers’ type writers. Tragically however he could not save his wife and son who were shot before his eyes as they were moved to a different camp. For anyone visiting Phnom Penh, I couldn’t recommend visiting these thought provoking sites more. It’s incredibly hard going however I think it’s so important to learn about these awful atrocities and pay your respects to those who lost their lives. We were completely blown away by the kind spirit of all the Cambodian people we met, and knowing how all of them, their families, their friends had been so recently affected by this atrocity made us appreciate their hospitality and outlook on life even more. That evening, Catriona and I popped out for a quick dinner in town. Whilst we were walking out suddenly we heard ‘Mairi, Mairi’. Completely confused as to who was shouting my name we turned round to see Sol, our tuk tuk driver ‘Mairi, be careful with your handbag’ – literally this was such a testament to the kindness we encountered in Cambodia. We ended up having dinner and drinks in the hostel before tucking down for an early night after a long day out. The next morning, we headed to the WN bakery for a hearty breakfast before boarding the bus. Next stop – Ho Chi Minh City – Vietnam!